The country's oldest lighthouse was built for Sir John Clayton in 1674 and designed for a fire to be lit on its top of the 80 feet high tower. King Charles II granted permission for dues to be collected from passing ships, however, Sir John went bankrupt soon after it was completed and it was probably never used. It was restored in 1996. 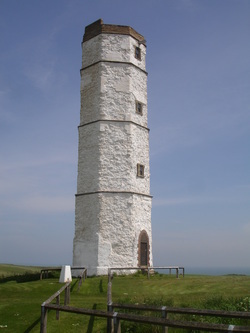 Between 1770 and 1806, 174 ships were lost off Flamborough Head and the present lighthouse was built.